Some people may seem naturally neat and tidy, however often these individuals worked to develop effective organizational habits. With repetition and time anyone can learn to change their habits and actions to become more organized. The following habits are easy to incorporate into your everyday life and will help get you and your stuff more organized. Start small with items like your keys and ensure that you place them in the same designated place every time. If you create labels for items, never label anything as “miscellaneous”. Remember everything has a place and a name. Don’t hang on to things that you aren’t using or have never used. Each item in an area should be something you use regularly or at the very least have used in the last year. Otherwise you should donate, sell, or trash those items. 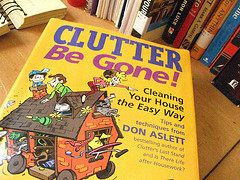 Establish a schedule that works for you to de-clutter and organize items that you use on a regular basis. Donating items to your favorite charity habitually is an excellent way to keep unused stuff from accumulating. If this is difficult for you, consider getting rid of an item whenever you bring in an item. Do not be afraid to throw it away. The best way to accumulate clutter quickly is by keeping stuff around that you don’t use. Stop the “I’ll do it later” or I’ll do it tomorrow” mindset. Complete tasks at the time you are thinking of it or put it on your daily to do list. Do it immediately and avoid procrastination. Hanging up and putting away clean laundry right away will help you keep your closets organized and tidy. When you get home from the grocery store, put everything away first. After the groceries are put away, straighten up anything that needs it and throw away any nearly empty containers or leftovers. Utilize technology to simplify and organize your life. Covert documents and paper to digital files to get rid of paper clutter. Scan photos and important documents and then store them with online storage or a portable storage device. If you have CDs and DVDs taking up space think about storing them electronically on a storage device or online medium. Look into the latest routers on the market. Many have features like available network storage which allows you to access your media from anywhere in your home. The only way you can organize your stuff is if you organize yourself. Making a daily schedule is an excellent way of having a system that you work through every day. If you are a stay at home parent or spouse; make a morning, midday, and evening task list. If you are a working parent, make a list for evening activities. Schedule bills, important dates and events on your calendar so you can see what’s coming up. Use a weekly schedule so you have a week to accomplish your goals and to-do’s instead of a singular day. This way if you don’t get something done in one day, you can still meet your goals and feel positive about your progress. Commit to trying some of these simple techniques and find what works best for you. The benefits of working toward becoming more organized are practically endless. Once you have yourself more organized, tackle rooms in your house with our room-by-room organization tips. Images by Rubbermaid Products and EvelynGiggles and licensed by Creative Commons.